9:00 am-10:00 am – Pumpkin Contest Weigh-In, Historical Society Grounds – North End of Track, 10:15 am Winners Announced & Prizes Awarded. 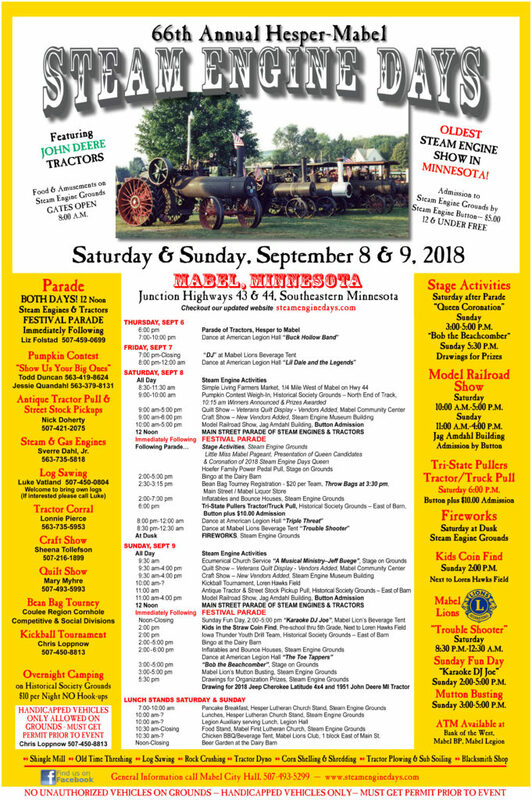 6:00 pm – Tri-State Pullers Tractor/Truck Pull, Historical Society Grounds – East of Barn. Button plus $10 Admission. 11:00 am – Antique Tractor & Street Stock Pickup Pull, Historical Society Grounds – East of Barn. 2:00-6:00 pm – Little Blue Choo Train. Free Rides Around Grounds. 5:30 pm – Drawing for 2018 Jeep Cherokee Latitude 4×4 and 1951 John Deere MI Tractor.